Do you ever wake up and wonder what was happening in fashion on that exact day 30, 40, or 100 years ago? Well I do, which is why I’ve started “On This Fashion Day”! 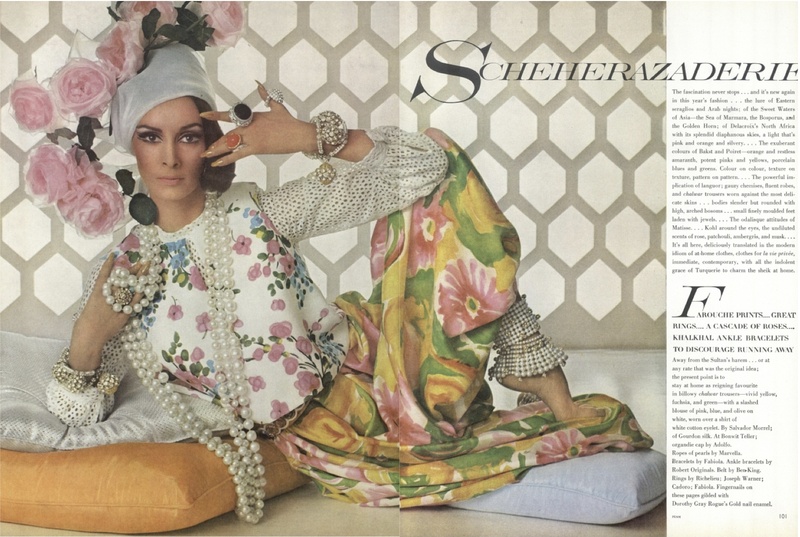 Today’s entry is actually “On This Fashion Month” since it’s from April 15, 1965. 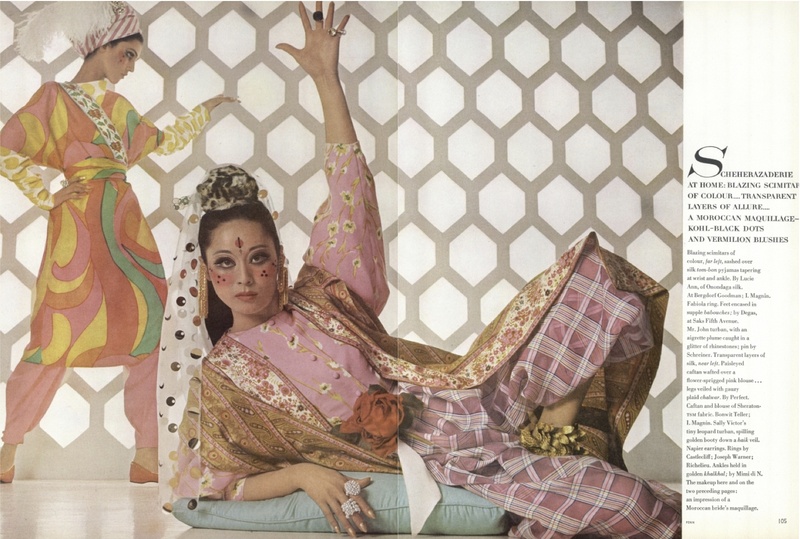 The editorial focuses on fashion’s continued fascination with “the lure of Eastern seraglios and Arab nights…of Delacroix’s North Africa with its splendid diaphanous skies…The exuberant colors of Bakst and Poiret…The odalisque attitudes of Matisse…It’s all here, deliciously translated in the modern idiom of at home clothes, clothes for la vie privee, immediate, contemporary, with all the indolent grace of Turquerie to charm the sheik at home.” “Scheherazaderie,” Vogue, April 15, 1965. All clothing by Eric Lund for Branell. Left: slippers by Marimekko, hat by Mr. John, bracelets by Arpad. Right: hat by Sally Victor, "bogus" pearls by Richelieu, bracelets by Robert Originals. Left: silk pyjamas by Lucie Ann of Onandaga Silk, turban by Mr. John. 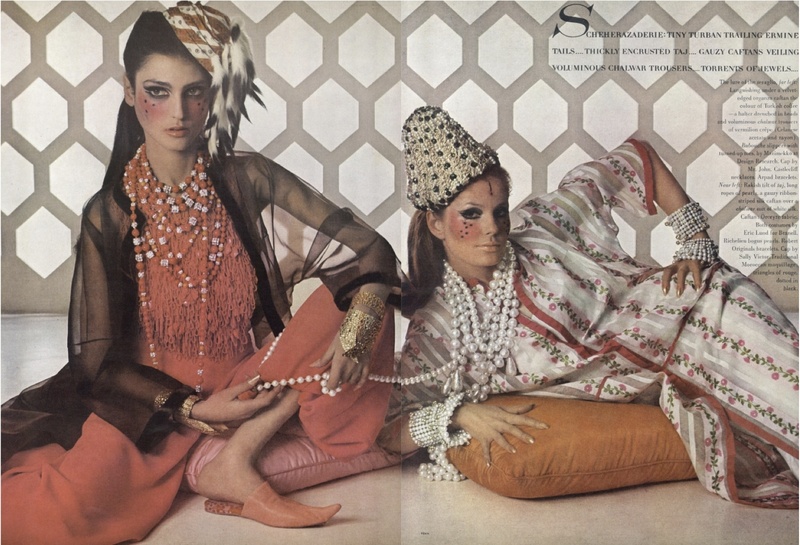 Right: caftan by Perfect Caftan, turban by Sally Victor, earrings by Napier, rings by Castlecliff, Joseph Warner, and Richelieu. Makeup an "impression of a Moroccan bride's maquillage." Different silhouettes, but look at those patterned pants, neons, and pastels — all of which are big right this moment. I mean, couldn’t you see the pattern of the harem pants in the first image on a pair of skinny jeans today?